The Indian community of Silicon Valley is preparing to welcome Indian Prime Minister Narendra Modi with open arms next week, in a route stop that has outshined the PM's ultimate U.S. destination--his meeting with President Obama. Mr. Modi comes to promote Digital India, and local Indians are preparing a rock-star reception at the SAP center in San Jose to rival his Madison Square Garden reception last year. But this unfettered hospitality also highlights the impunity with which states like India and the US may now exercise violence and the intolerance for minorities and minority views that underwrites that violence. Some of the fanfare around the PM's visit is skillfully generated by right-wing Hindu organizations here and in India, but much of it is genuine--many equating pride in Modi with pride in India and many genuinely proud of Modi himself. There is certainly much to remark in the rise of this humble man from Gujarat through the ranks of the RSS, the right-wing Hindu nationalist organization through which he built his political career in the BJP party. A vegetarian, workaholic, evidently celibate politician would hardly seem to fit the hedonistic and rebellious image of a "rock star," but the meaning of "rock star" has now shifted, particularly in Silicon Valley. As a New York Times Magazine author noted, "Pretty much anyone can be a 'rock star' these days -- except actual rock stars, who are encouraged to think of themselves as brands." Modi comes as the brand ambassador for India, specifically Digital India. Indians trust him in this capacity partly because he has so successfully recast his own image. Who remembers the villain of 2002, the Chief Minister of Gujarat who was blamed for the death of two thousand Muslims in his state and denied a visa to enter the United States until 2014? As victims and their families remain unpersuaded by verdicts of state innocence, cases continue to make their way through the Indian court system on appeal. But while they await resolution, Silicon Valley has forgotten the Modi of 2002. This is partly because the War on Terror has normalized state violence in America. The idea of denying Modi a visa to the United States now seems bizarre: the land of remote-controlled drone strikes and Ferguson is hardly in a position to refuse entry to anyone with blood-stained hands. To the contrary, Modi in America is perfectly fitting. And what better place to assemble the tools for a "Digital India" without privacy safeguards than the Silicon Valley that has given us a "Digital America" serving the NSA? When a persistent few rake up unpleasant memories of 2002, the Modi regime shrewdly invokes 1984, when its rival the Congress Party connived in pogroms against Sikhs--as if the older unpunished atrocity cancels out or excuses the 2002 events. But they have a point; impunity builds on itself. Earlier this year, the traumatized Sikh diaspora persuaded the California State Assembly to recognize the Indian government's responsibility for the November 1984 Genocide of Sikhs. Three decades of frustration with the Indian state produced this Californian acknowledgment. To be sure, the Congress PM Manmohan Singh, himself a Sikh, apologized for 1984 in the Lok Sabha in 2005, but prominent Congress politicians involved in the violence have never been brought to justice. They acted with impunity, and so too, then, does the BJP. But if Congress was the villain of 1984, there is no love lost between the Sikh diaspora and Mr. Modi (whatever the BJP partnership with the Akali Dal in Punjab); Bay Area Sikhs plan to protest Mr. Modi's exclusion of minorities from his nationalistic agenda when he is here. Perhaps they have learned through bitter experience that the Indian state is the problem, whatever the party in power. Its violent, stepfatherly approach towards minorities is in its DNA. Before 1984, there was 1947, when on the eve of the formation of the newly independent states of Pakistan and India, Hindus, Muslims, and Sikhs were victims and perpetrators of violence at least passively abetted by the departing British government. The history of impunity is long in South Asia, and the diaspora expands with each episode. In 2003 and 2004, the US Commission on International Religious Freedom particularly noted that those who carried out acts of religious violence in India were rarely held accountable for their actions. Every good historian knows that it is impossible to undo the past. Truth and reconciliation, reparations, apologies, and restitution--these are tools we have invented not to change the past but the present and future. They do not undo history; they make history. But it has become impossible to even reach for these tools to address 1984, 2002, and the many other instances of state-abetted violence among India's many communities. There can be no diplomatic shaming such as visa denial when state violence has ceased to be a scandal anywhere and has become accepted as merely the routine exercise of state power, with impunity. What then should be the mechanism for producing justice, not just peace, for the victims of such violence? The Modi regime expects silence. It meddles with cultural and academic institutions, threatens NGOs concerned with the environment and human rights, and exacts vengeance on those who question the official line on 2002. As beef is banned, conversion encouraged, and textbooks doctored, Indians today produce and consume a distinctly Hindu-branded India. Dissent elicits vicious threats. The 130 scholars of South Asia at American universities who signed a letter calling for meaningful engagement with the PM on his visit to Silicon Valley have been told they are blacklisted. More worrying for these scholars, as educators, is the willful ignorance behind this attack: 1) the presumption that they are uncritical of American policies and of previous Indian regimes, when even cursory examination of their work immediately reveals the idiocy of such a presumption, 2) the contempt for the humanistic disciplines to which many of them belong. Development is not merely a technical problem for engineers but a set of human, material, and ethical challenges for everyone, in which humanistic and social science disciplines play a major role, particularly in calling attention to the rights of communities and individuals vis-à-vis governments. Mr. Modi came to power promising growth and good governance. 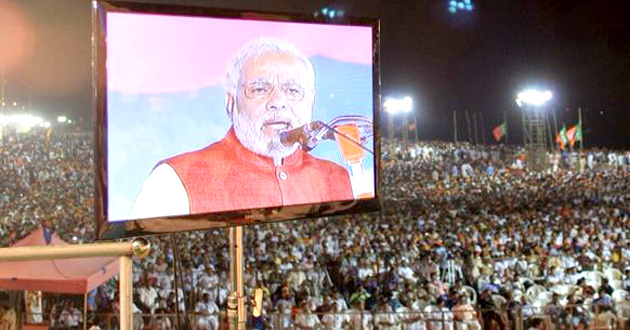 His initiatives, Clean India, Make in India, have so far failed to bear fruit. His base in Gujarat is shaken by violent riots by frustrated youth. A call for critical engagement with a Digital India project proposed by a PM with a record for compromising freedom and little to show for his other initiatives is not anti-technology or anti-Hindu but reasonable and necessary. It is a call for ordinary active citizenship. The faculty letter spoke from the West to the West (Silicon Valley people, not "CEOs") about an event in the West; this was no imperialistic intervention in Indian affairs (even though the diaspora includes those who are casualties of "internal" Indian affairs.) The letter was a reminder that the arrival of the Indian prime minister is an opportunity for serious engagement. He is the PM, not a brand ambassador or a rock star. "Rock star" is a style, a claim to celebrity based, evidently, on the size of a person's Twitter following. Style has its place and its own revolutionary potential. But a PM must deliver substance, too. Failure to deliver tarnishes the brand; ask any investor.